I’ve never been unhappy with my old workbench. It’s dependable. Small enough to be able to work on all sides, which makes it perfect for chair making. Solid and heavy duty. 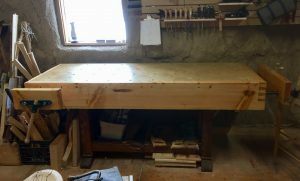 It’s great so why build a new workbench? The main reason is that the new shop really felt like it needed another bench on the south wall. 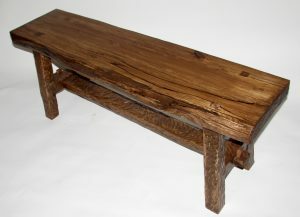 Plus, once I start running chair making courses the extra bench will be a necessity. It was more than that. The extra space will be awesome to have especially when I have more than one project on the go at a time. What I really wanted though was to have an end vise and a bigger front vise. Now I have it! The base is all mortice and wedged tenons. Very solid. I used some Douglas fir that I milled last summer. It wasn’t quite as knot free as I would have liked, but I’m not worried about lack of strength and the knots give it a bit more character. 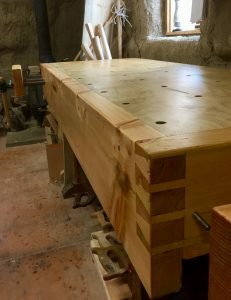 The top is just over 6′ long and almost 3′ wide by 3 1/2″ thick. It’s very heavy! In fact I almost couldn’t flip it over when I was installing the vises. The apron is 2 1/2″ thick by 9 1/2″ wide. I really like how the dovetails came together on the corner. At some point in the future I will add dog holes in the apron I just didn’t have the heart to drill holes in it this soon after finishing it. They will probably wait until I’m jointing a long board that needs a little extra support. The front vise has 16″ jaws and an opening of 13″. The front jaw has dog holes which match the dog holes in the bench top. This means I can use it like an end vise as well.The end vise is the full width of the bench top. I went with round dog holes because I’m a huge fan of hold fasts and they need round holes to work. Also I can turn an endless supply of wooden dogs (customizable to whatever height I need) on the lathe. Now, what am I going to make first! We’ve entered a new world here at SilverTree. 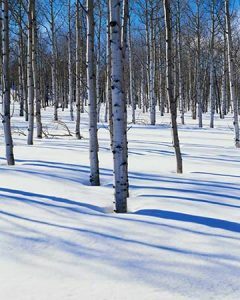 Dog sledding and all its associated activities have become one of our new winter sports. Our oldest has become fascinated with all things mushing and as tends to happen around here the rest of us catch some of his enthusiasm. There are lots of variations of dog sledding. 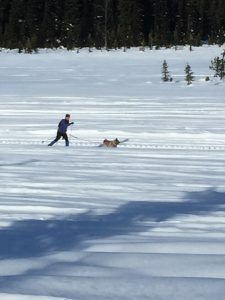 Skijoring, where you ski while being pulled by a dog. Scootering ,where you ride a scooter while being pulled by a dog. Canicross, where you run while being pulled by a dog. I think you can see the general theme that develops. Essentially, musher sports are anything where some of your propulsive force is provided by a dog. It is tremendously fun and there is a wonderfully supportive community out there just waiting for you to join them. As a woodworker I can’t help but to think of everything through that lens. Where’s the connection with dog sledding? When I start working on a chair I try to begin with the best wood I can find. Nice straight grain, tight growth rings, no knots or other defects. Same with mushing. You want to start with the best dog you can find. Good parentage, nice personality, the right breed. However well you begin, either with wood or dogs, you will find that both have personalities of there own. We were at a skijoring event last weekend and had left our dog in the car as we went to register for the race. She decided she’d rather not wait in the car and so (whether by accident or not) managed to get herself into the drivers seat where she proceeded to turn on the hazard lights and honk the horn until we came back for her. Personalities indeed! The key, after doing your best to start well, is to work with you’ve got. The best sled teams are the ones where the musher and the dogs work together. They don’t expect their Malamutes to be as fast as their Alaskans but they know they will be able to pull a lot more weight. Even individual dogs will have their own strengths. The key is to know them well enough that you know what you can expect from them and how to motivate them to achieve their best performance. We woodworkers know that some species of wood are better at some things than others. Cedar looks and smells great but maybe it’s not the best choice when strength is what you’re after. 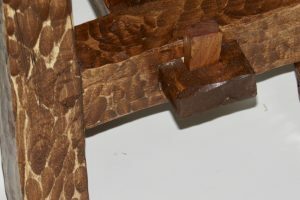 Even individual pieces from the same tree will have different characteristics. You need to know it well enough that you know what you can ask of it. You’ve got to work together! Oh and the coolest dog sleds are made of wood and involve steam bending. So we’re hooked.